You are here: Home Cat Jewelry 14k White Gold Black and White Diamond Cat Pendant (1/5 cttw), 18"
Ideal for the person with a feline fetish, this sassy White Gold Black and White Diamond Cat Pendant is sure to cause a purr. 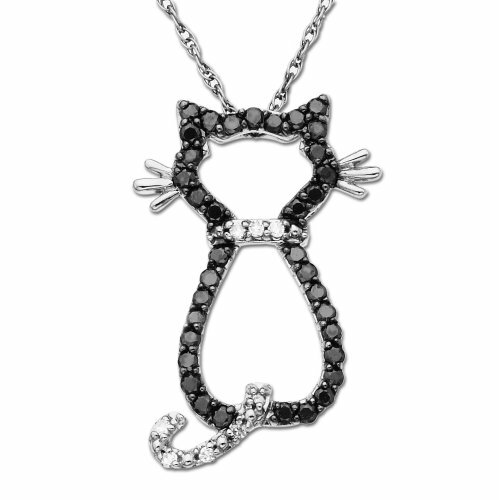 Forty-four round black diamonds outline the cat's body while the sparkling round white diamonds mark the tail and collar. The pendant is backed by beautiful 14k white gold metal that also forms playful kitty whiskers. To finish this decorative piece is a 14k 18-inch white gold rope chain that features a sturdy spring-ring clasp.